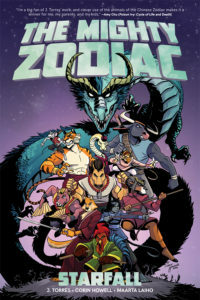 Collects the first six issues of the fantasy and fable adventure, The Mighty Zodiac! One dark and quiet night in Gaya, six stars fall from the sky. 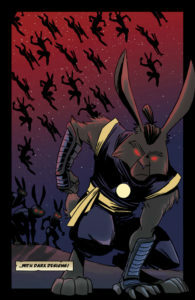 Master Long, the ailing leader of the Mighty Zodiac, sends his warriors out to collect the stars before the Moon Rabbit Army can get their paws on them first. 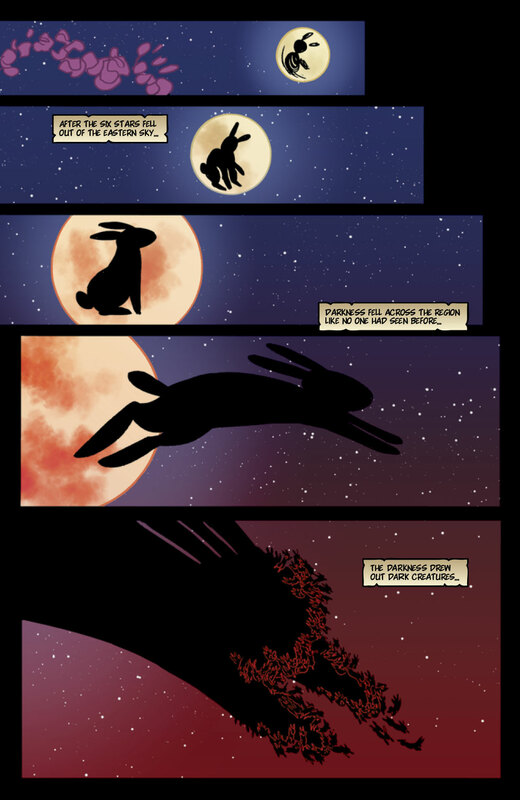 If the Rabbits get the stars, the balance of nature—and the fate of all of Gaya—will be in danger. 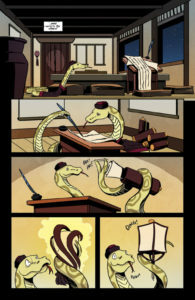 But Long’s plans to use the stars to “cure” his illness may be just as dangerous—and bring an end to the Mighty Zodiac itself. 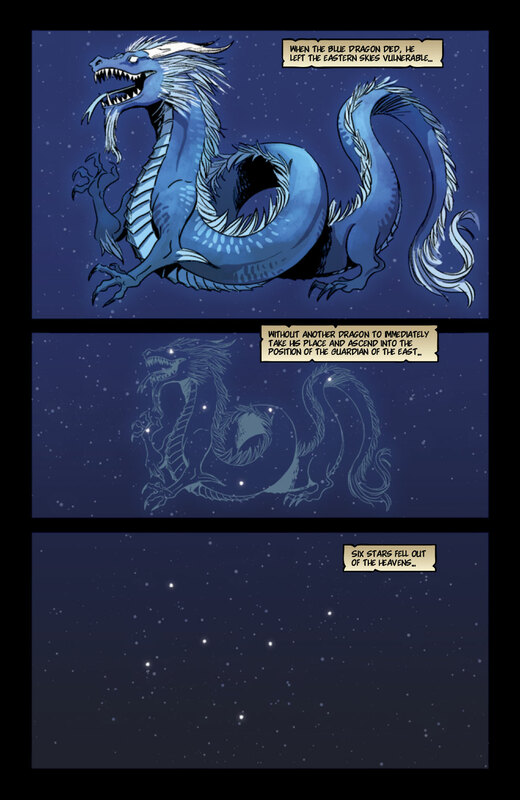 A long time ago, in a land far away (not “far, far away”), there was the legend of the Blue Dragon who guarded the Eastern skies against all threats. 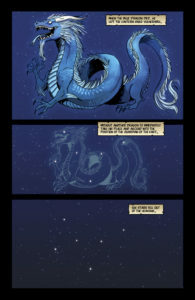 When it was time, the Dragon would leave the sky, plunging to Earth in the form of six fallen stars. Those stars would herald the rise of the next Great Dragon, and the cycle would continue. The stars have fallen, but it was too soon. 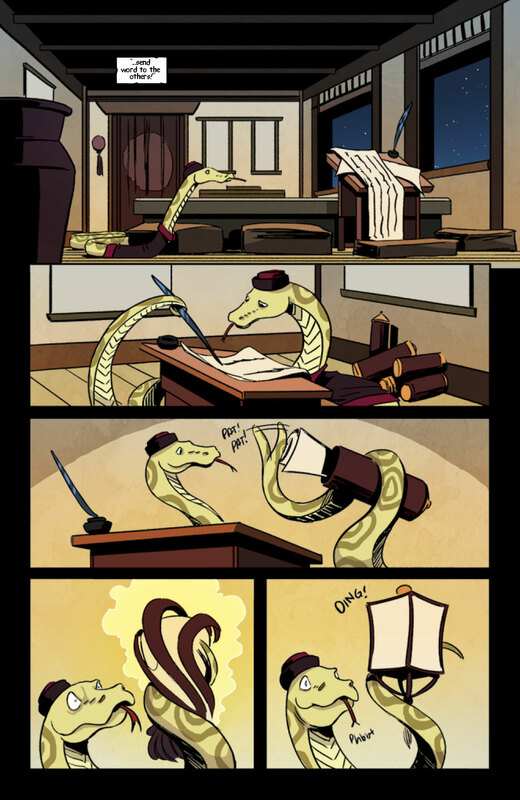 Master Long, the serpent destined to take his place in the sky as the next Guardian isn’t ready. His students, The Mighty Zodiac, are scattered across the countryside when they get the call to return to Twilight’s Bastion, to gather the fallen stars and bring them to Master Long. Standing in their way is the Moon Rabbit Army, shadowy beings determined to keep the Dragon out of the sky so that they can end their imprisonment on the moon and return to Earth. When they do, they were bring with them an age of darkness and oppression, of greed and hate, the likes of which has not been seen in many thousands of years. Now the students of Master Long are all that stand in the way… Tan the Rooster, Mar the Ram, Yaya the Monkey, Ko the Cat, Kane the Dog, Mal the Horse, Hesh the Snake, Buta the Boar, Tok the Bull, Rang the Rat, and Great Tiger Ho! Together they form the Mighty Zodiac, and will stand before the darkness that threatens all of creation! Wow, that all sounds pretty intense, huh? I mean, I wrote that and even I have to wonder if it isn’t a little over the top. Then again, that’s kinda what it’s all about, isn’t it? If you’re up on mythology from any culture, it’s all about grand designs and insurmountable odds, heroic deeds to counter unimaginable evil! Crap, I’m doing it again… Sorry. At its core, The Mighty Zodiac is a fable in the purest sense of the word. The heroes are larger than life, and the foes they face are evil without a doubt. The odds are against them and the stakes are nothing less than life on Earth as we know it. With all of that going on, it really is easy to get caught up in the moment… And in this case, the heroes aren’t even human! 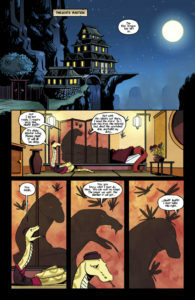 In the spirit of Kung Fu Panda, J. Torres, Corin Howell, and the rest of the team at Oni Press have put together a story of high adventure that any age group should be able to get into. Disney couldn’t have done this any better, and they pretty much invented the anthropomorphized animal concept. As of the writing of this article, I’m still only about halfway through the 150-ish page long book, and I can safely say that it’s kept me entertained and ready for more. 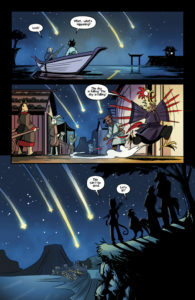 While the story itself is absolutely suitable for younger readers, J. Torres has walked that fine line, crafting a tale that’s still palatable for adults. While my wife would argue that I only qualify as “adult” by the legal definition, I’ve read enough to know that there are lines that have to be drawn. And that brings us to the art, lovingly and carefully rendered by Corin Howell. With a cast of characters that includes most of the animal kingdom, keeping them recognizably furry (or scaly… or feathered) while keeping to the humanoid form- with the exception of Hesh and Master Long- is an impressive feat. Howell’s work had me thinking back to the awesomeness that is Usagi Yojimbo. The action is well done, showing the expected martial arts mayhem without displaying too much in the way of actual violence. It’s just a damn fun book to read. Or darn fun, if you’re going to read it with your kids. Your choice.